A review by Holly Bass for The New York Times. In the American historical imagination, the North (even beyond our borders into Canada) symbolizes freedom, individual expression and progress, while the South conjures a mix of hospitality, religious fervor and persistent racial prejudice. It’s a cultural civil war that in some ways enables us to sidestep the more complicated realities of our national identity. 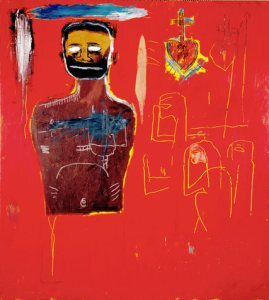 Two recent exhibition catalogs ably situate the work of Jean-Michel Basquiat within these potent cultural poles. Each monograph speaks to the impact of place on both the creation of work and the viewing of said work. In this case, the French influences in New Orleans and Toronto’s remarkable ethnic diversity echo the artist’s own culturally hybrid background.